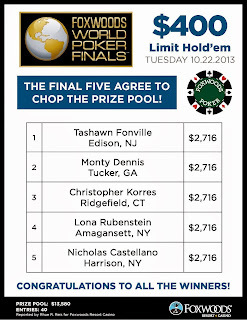 We have reached the final table of the $300 No-Limit Hold 'em Bounty event at the 2013 Foxwoods World Poker Finals. 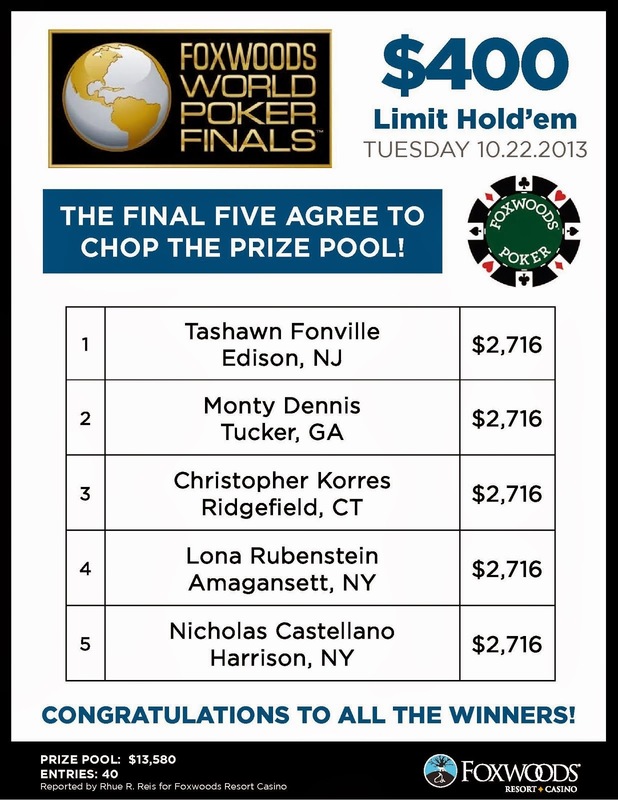 Shipped the tourney for my biggest score by a lot. 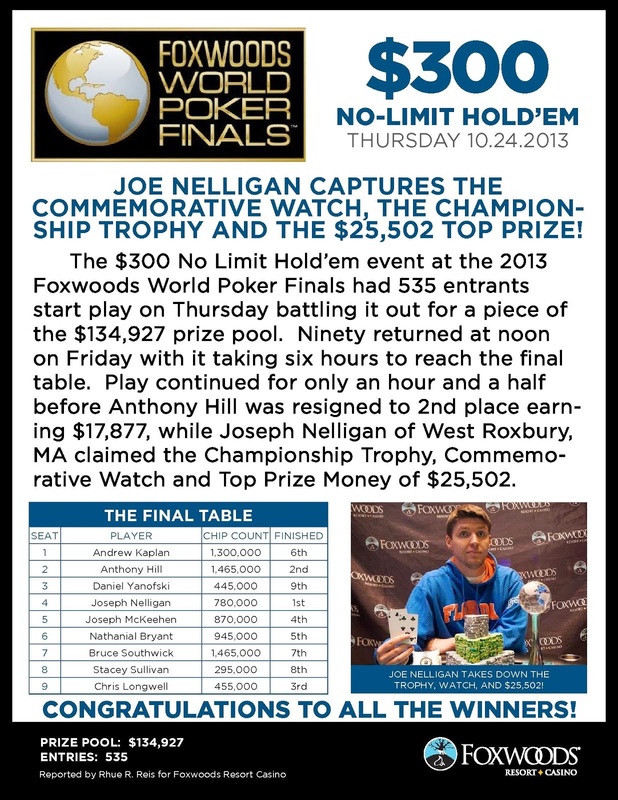 For his victory, Joe takes home $25,502 as well as the World Poker Finals trophy and watch. We have reached the final table in the $300 No-Limit Hold 'em Re-Entry Event #8 at the Foxwoods World Poker Finals. 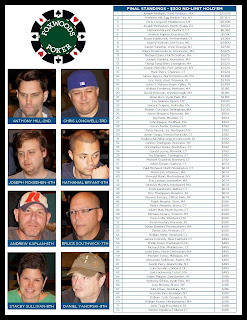 Anthony Hill and Bruce Southwich are currently tied for the chip lead with 1,465,000. Blinds are currently 15,000-30,000 with a 5,000 ante. 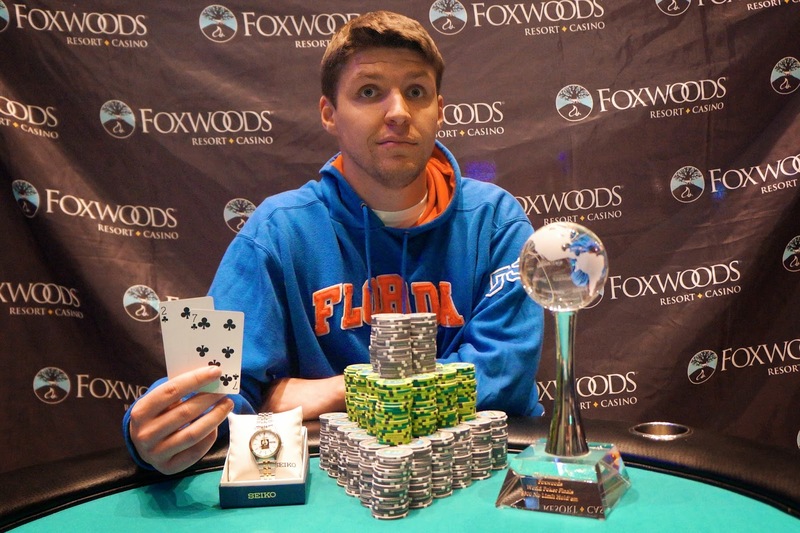 We had a total of 89 entries in the $400 Omaha Hi-Lo event at the 2013 Foxwoods World Poker Finals. 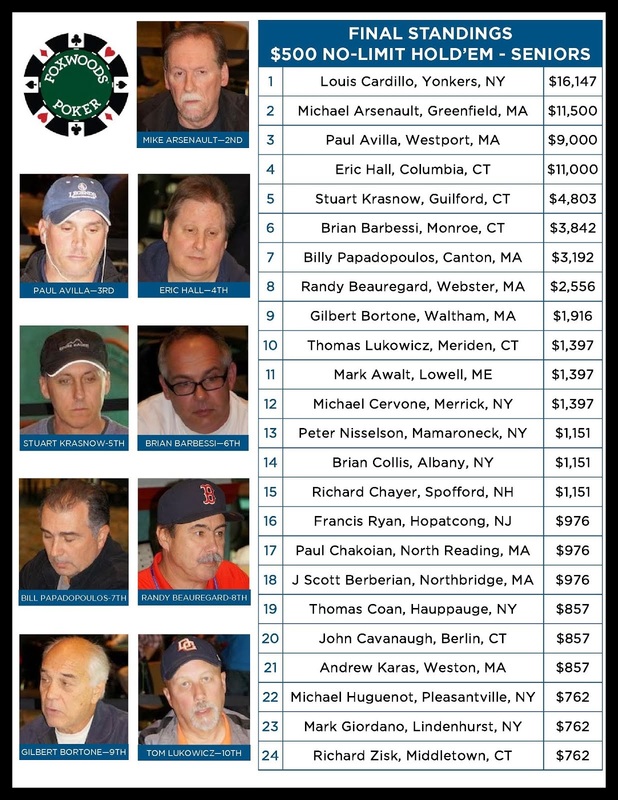 The final 12 spots will finish in the money with first place taking home $8,506. 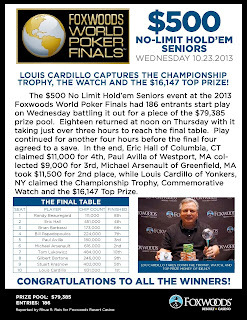 We had a total of 261 entries in the $200 No-Limit Hold 'em Bounty event at the 2013 Foxwoods World Poker Finals. The final 36 spots will finish in the money with first place taking home $8,775. 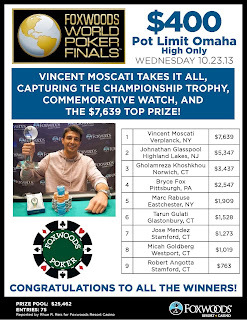 Event 8 - $300 NLHE Re-Entry is in the Money! 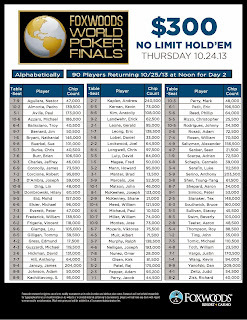 Less than an hour into play on Day 2, we have reached the money with 72 players remaining in the $300 No-Limit Hold 'em Re-Entry event. 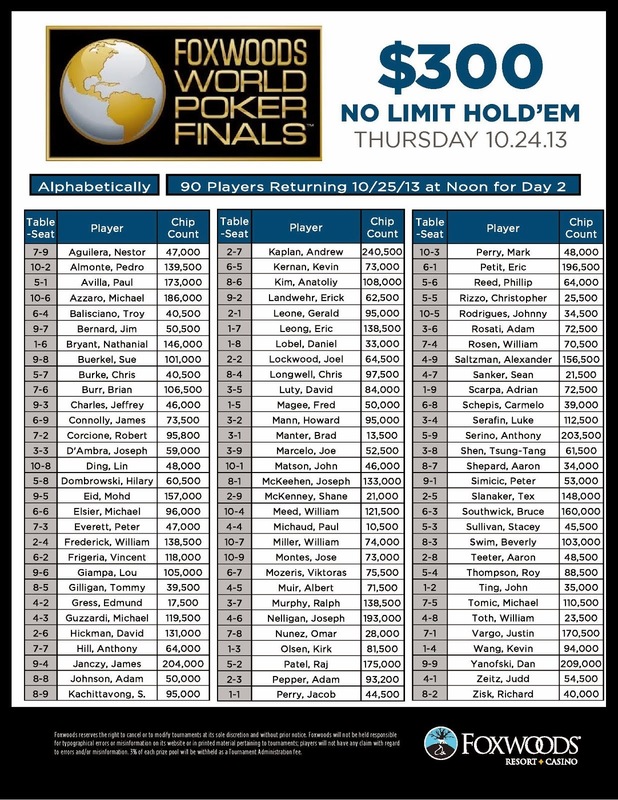 We are down to the final 90 players as Day 2 of the $300 No-Limit Hold 'em Re-Entry Event 8 kicks off. 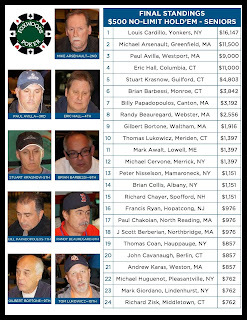 The final 72 players will finish in the money with first place taking home $25,502. We will be playing down to a winner today. 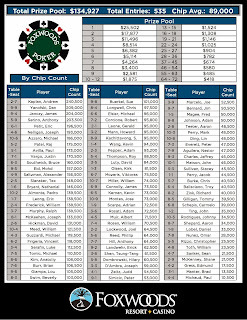 The blinds are currently 1,500-3,000 with a 500 ante and the average chip stack is just over 92,000. 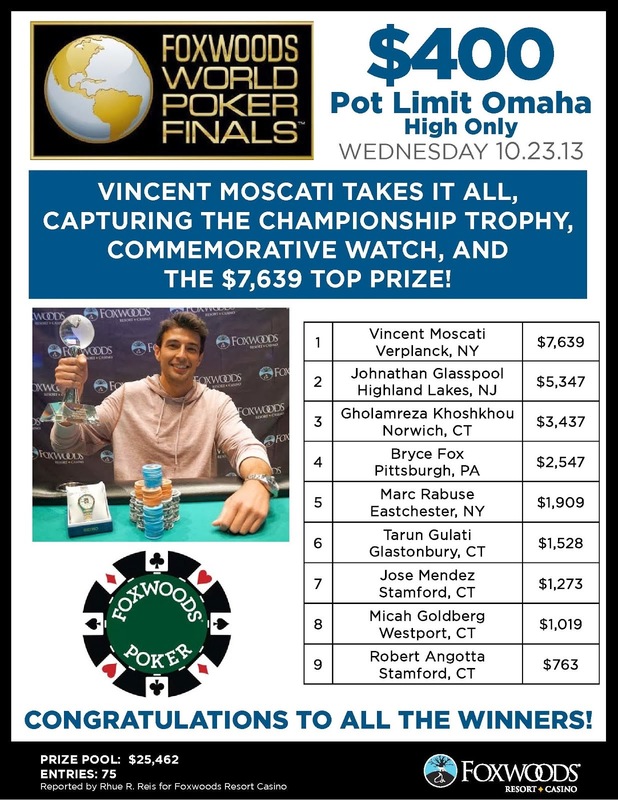 You can watch the live stream of the featured table by clicking on FoxwoodsLive.com. 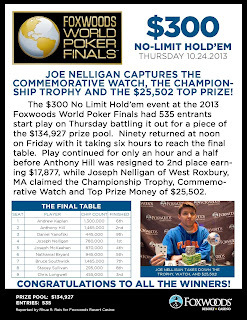 Flight B of the $300 No-Limit Hold 'em Re-Entry Event 8 had a total of 273 entrants. The Flight A and Flight B fields will combine to form Day 2 that will kick off at noon on Friday.